By now you should know how much I love chalk paint. I’ve used it on everything from refabulating a dresser, to painting my entire wood paneled kitchen. If you’re like me and would prefer to make your own instead of shelling out the big bucks for the brand name, then this post is for you. 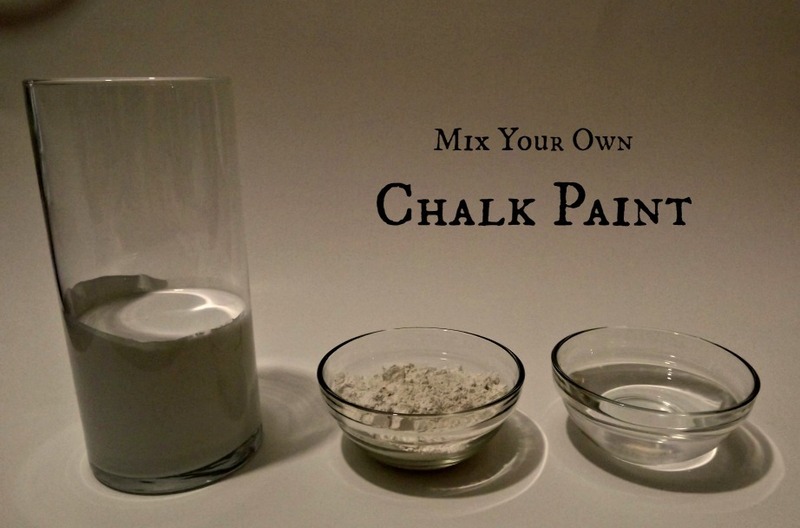 Yes, it really is as simple as mixing in plaster into the paint…but wait. As simple as it is to mix, it is also just as simple to get wrong. When I first started mixing it myself, I would just dump in the powder and mix, mix, mix with my stick blender. Even though the paint worked fine, I had to do some sanding to get a smooth finish. I also found that when I went back to use leftover paint, the plaster would form little hard plaster pellets that did not smooth out when painting. This makes for an unsightly finish. Then it hit me. DUH! Why not moisten the plaster with water before mixing in with the paint? that way the plaster is dissolved, eliminating any possibility if not combining with the paint pigment. Sometimes the simplest idea escapes me. Does that happen to you? Mix the Plaster with just enough water to make a thin paste. Then mix into the paint. That. Is. It. I think all knotty pine should be banished with paint! Oh yes, I remember the pearly color…speaking of which I still need to apply it to the rest of the white paint, SMH. So go for it, get out your brush! whatcha waitin’ fa!